Conceptual Physics: What are Super Conductors? Certain Metals when cooled, their electrical resistance decreases in usual way as in normal conductors, but on reaching a temperature a few degrees above absolute zero they suddenly lose all trace of electrical resistance. Then they are said to have passed into superconducting state. Kamarlingh Onne was the first to observe this peculiar property in case of Mercury in 1911. In the course of his investigation of electrical resistance of a sample of Mercury dropped from 0.08Ω at about 4K to less than 3x10-6Ω over a temperature interval of 0.01K. Super Conductors are extra ordinary because they take no energy at all to make current flow in a conductor and no energy is lost to friction to sustain the current either. Its electrical resistance is precisely zero. One of the important characteristic property of super conductors is that their electrical resistance, for all practical purposes is zero below a well defined temperature Tc, called Critical or Transition Temperature. For instance, semiconducting mixed oxides of Barium, Lead and Bismuth. 1. The current in super conductors persists for a very long time. 2. The magnetic field does not penetrate into the body of super conductor. This property known as Meissner Effect is fundamental characterization of super conductivity. 3. When the applied magnetic field ‘B’ is greater than Critical value Bc(T), the super conductor becomes a normal conductor. Bc(T) is zero at T=Tc and has the largest value at T=0. 4. When the current through Super Conductor is increased beyond a Critical value Ic(T), Super Conductor becomes a normal conductor. 5. Specific heat of the Super Conducting materials shows an abrupt change at T=Tc jumping to a larger value for T<Tc. The super conducting state of metal exists only in a particular range of temperature and field strength. Super conductivity state will disappear if the temperature of specimen is raised above its critical temperature Tc or if a sufficient strong magnetic field is employed. 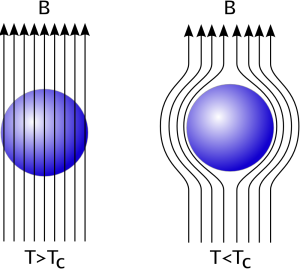 The critical field for which super conducting property loses is a function of temperature. H0 is Maximum Critical Field Strength at temperature absolute zero. Superconductors which are resistance less materials have an additional property of exclusion of applied magnetic field on it i.e. inside a superconducting material, we always have B=0. The property of perfect diamagnetism arises in super conductor because when a magnetic field ‘Ba’ is applied surface screening currents circulate so as to produce a flux density ‘Bi’ which every where inside the metal exactly cancels the flux density due to applied field Bi=-Ba. This property of exhibiting perfect diamagnetism by super conductor is known as Meissner Effect.